Where do the posters for your favorite Broadway shows come from? Well a new book celebrates the Drama Desk Award-winning artwork of Frank “Fraver” Verlizzo with more than 250 of his theatre poster designs from Broadway, Off-Broadway, and around the globe that includes, The Lion King, Cat on a Hot Tin Roof and Agatha Christieʼs The Mousetrap. For the first time in his five-decade career, this book will take audiences behind-the-scenes into the world of theatrical advertising through hilarious career anecdotes and commentary from theatre icons, including Bernadette Peters, Dean Pitchford, and Jack Viertel. I caught up with Frank to find out about how his love of design and his love of theatre intersected. Where did the love of design and art originate for you? I definitely owe my love of art and design to my mom. She was an avid museum-goer and started taking me along at a very early age. I recall being fascinated by the painters (especially at The Met) who’d set up their easels and were copying The Masters. I don’t think that’s even permitted these days! Is there a specific moment/piece of art you saw that served as inspiration to pursue this as a career? As an art student, I often visited Times Square to look at the signage for Broadway shows and the latest movie epics. I vividly remember being stopped in my tracks by the billboard above The Palace Theatre for the musical, Applause. That was the moment I knew it’s what I wanted to do! I was always drawing. I took the art test for admittance to the High School of Art & Design in NYC, and passed. After graduating A&D, I went on to attend one of the best art schools in the world, Pratt Institute, in Brooklyn. It was there that I was lucky enough to have as my teacher, David Edward Byrd. He was famous for his Fillmore East rock posters, and was making headway onto Broadway with his landmark artwork for the original production of Stephen Sondheim’s Follies. He definitely cemented my interest in Broadway poster design. 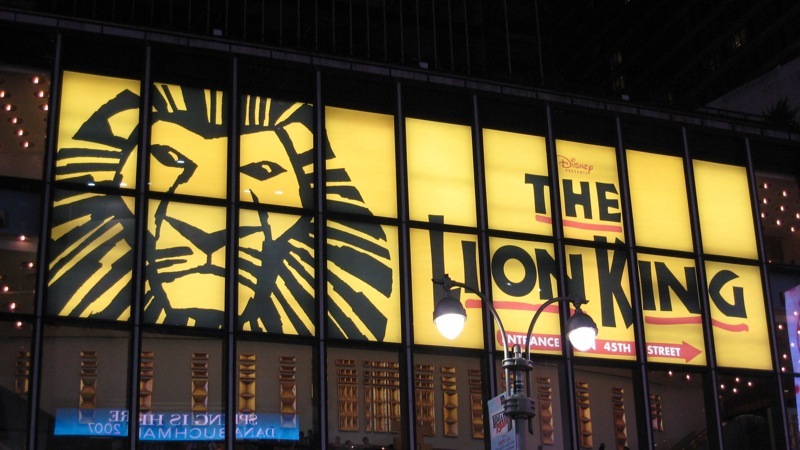 The design of The Lion King has become as iconic as the Phantom‘s mask or the cat eyes for Cats. How does it feel to know that something you designed stands as a global icon to not just the show, but to Broadway ingenuity? It’s really a dream-come-true. I’ve been fortunate enough in my career to have designed the posters for quite a few legendary original productions. To have my work seen around the world as an example of Broadway excellence is something extraordinary! Of all the imagery you’ve designed, is there a top 3 that have meant the most to you? Yes, indeed! Being a major Stephen Sondheim fan, my #1 favorite is Sunday In The Park With George. #2 is Sweeney Todd. #3 is The Lion King. How about designs you look at and think, “I should’ve changed this or that.” I know as a writer, that happens to me all the time. How often does that happen to you? That happens often enough for sure! But honestly, once I witness an theatre audience looking at their Playbills with my poster art on the cover, I’m convinced it was the perfect way to go! How do you continue to challenge yourself? How do you keep what you do from becoming business-as-usual? One of the wonderful aspects of working on plays and musicals is that each one is so very different—and has its own personality. I treat every show I design posters for (be it Broadway, Off-Broadway, Regional, or Institutional) as if it’s going to be “the next big thing” in theatre. In today’s digital culture where people can create on their phones, what is your advice to young artists who want to pursue a career in creating? As artists, it’s great to have technology and its various tools at our disposal. I add my Mac onto the list of mediums I can tap into along with my airbrush, pen and ink, charcoal pencils, acrylics, and oils, etc. But, remember, everything starts with a concept, a vision, an idea. Being adept at Photoshop and other apps will only take you so far. How did it feel to hold this beautiful book in your hands knowing it’s 200 pages of your work over so many years? My entire body started to vibrate when I first laid eyes on the real book (after seeing it only in PDF format!) I hope readers find it of interest. Fraver by Design, of course, celebrates theatre poster art—but I hope, my book also honors Broadway history, and the evolution of theatrical advertising from the 1970s until today! Get your copy of Fraver by Design today!